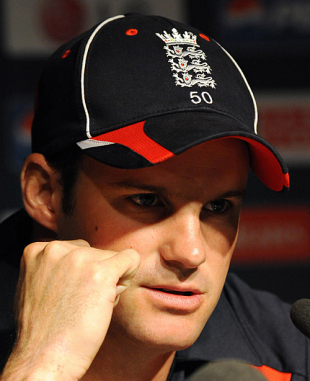 Andrew Strauss is usually as affable as international captains come, but despite his upbeat sentiments, there was no disguising the exhausted despondency with which he addressed the media in Johannesburg on Wednesday, as England prepared to face the music in a one-day competition that has humiliation stamped all over it. True, they arrive in the country boasting a winning streak of one match, after denying Australia a 7-0 whitewash in the final ODI of the English summer on Sunday, but even in that irrelevant face-saver, they still shipped six wickets chasing 177. And now, with respect to an Australian side that may be the reigning Champions Trophy champions but are still in an undeniable rebuilding phase, England prepare to face a team that really knows how to play one-day cricket. Sri Lanka simply hammered the much-fancied tournament hosts, South Africa, in the opening match on Tuesday. Tillakaratne Dilshan's majestic hundred put the match out of reach, as the wiles of Ajantha Mendis proved too canny to allow a 300-plus target to be pursued with any confidence - even for a team stacked with the sort of power-players that England can only dream of. In the absence of Kevin Pietersen (who has scored two of England's three ODI hundreds since January 2008 - a tally that even Scotland has surpassed) and latterly Andrew Flintoff and even Luke Wright, England lack batsmen who can break the shackles, and raise the tempo. Strauss has been batting like a dream all summer, but even at his most imperious, he is still a man for whom an 80.00 strike-rate is a pacey tempo - hence his unfortunate habit during the Australia ODIs of getting out when well set, usually while attempting a reverse-sweep or similar, shots that his colleagues ought to have been producing while he continued to anchor the innings. Strange results are possible in 50-over cricket - let's not forget, when England were last humiliated by Australia in a one-day campaign, in Australia in 2006-07, they somehow emerged with the CB Series trophy in their luggage, after Paul Collingwood stitched together back-to-back victories in the finals. But they've never yet won an ICC global event, and they've rarely looked less ready to break that habit. The rarefied atmosphere of the Highveld is no place for weary cricketers. With so many key players injured, and too many of the current incumbents out of form, it's hard to know how England can hope to improve on their home form. Ravi Bopara and Owais Shah have been woefully short of confidence and one of that pair could well make way to enable England to field an extra seamer - which could well be their one trump card, having seen how dramatically South Africa's early-season wickets have zipped around so far. Whether Tim Bresnan ousts Graham Onions depends on how much England value his extra batting abilities. England (possible): 1 Andrew Strauss (capt), 2 Joe Denly, 3 Owais Shah, 4 Paul Collingwood, 5 Matt Prior (wk), 6 Eoin Morgan, 7 Stuart Broad, 8 Graeme Swann, 9 Tim Bresnan, 10 Ryan Sidebottom, 11 James Anderson. Sri Lanka have very little to improve upon. Sanath Jayasuriya remains a concern at the top of the order, but he'll play on until he drops, while the tireless Muttiah Muralitharan never ceases to be a menace. Lasith Malinga's round-arm hostility will be a familiar but awkward challenge for Joe Denly, who will have gained a valuable sighter of his unorthodox action in the Kent nets. Sri Lanka (probable) 1 Sanath Jayasuriya, 2 Tillakaratne Dilshan, 3 Kumar Sangakkara (capt/wk), 4 Mahela Jayawardene, 5 Thilina Kandamby, 6 Thilan Samaraweera, 7 Angelo Mathews, 8 Nuwan Kulasekara, 9 Muttiah Muralitharan, 10 Lasith Malinga, 11 Ajantha Mendis. An ICC event in South Africa was where James Anderson made his name way back in 2003, when he was the rising star of England's attack, not least during a monumental performance against Pakistan in Cape Town when, in the immortal words of Cricinfo's erstwhile scribe, Rob Smyth, he proved "so good under the lights, he ought to have been a moth". If he can replicate the hostility that he showed in patches during the Ashes, and exploit the moist conditions that tend to prevail when the evening dew kicks in, he can cause a flap once again. Assuming England's batsmen give him a total to defend, that is. It's early in the season on the Highveld, so who knows what to expect? So far, there has been evidence of helpful bowling conditions, unsurprisingly, and there has been plenty of rain in the high-altitude air as well. Jayasuriya has scored 28 ODI hundreds in 439 matches spanning 18 years. The 11 players who took the field for England in the seventh ODI at Chester-le-Street have a grand total of nine hundreds between them. Paul Collingwood, the most-capped player by a distance, has notched up 166 appearances. England have played three matches at the venue, all against South Africa, and at the third attempt they recorded their first win, by 26 runs in a rain-affected contest in 2005, notable for Kevin Pietersen's hostile homecoming. "It's not a long tournament, a bit of a sprint and quite exciting to know if you play well in three games you're in the semi-final. We can wipe the slate clean to be honest." Strauss is optimistic that England's revival is on the cards. "As a side, I feel we are still firing at 75% maybe. So we have a lot of areas to improve, but the good thing is that we're still winning." Ominously, Kumar Sangakkara believes Sri Lanka's best is yet to come.